Before I begin, I’d like to start off by saying that if you haven’t seen this yet, just know that there’s definitely a few extra scenes at the ending—one short scene a few minutes into the credits, and another one at the very end. The first, in particular, is worth sticking around for. I won’t say more than that, though I’m tempted to. I actually don’t think the above is an official poster—in fact, I think it might have been made by a fan, but I chose it because I feel like it most accurately reflects how I felt about this movie. The title might have “Thor” plastered all over it, but really, I felt like this was more of a Loki movie, because Tom Hiddleston really did steal the show here. And he does a fantastic job. The way he portrays Loki is exactly how I pictured him to be from all the Norse mythology I grew up reading. (I was a total Greek and Norse mythology geek when I was little. Couldn’t get enough of the stories.) He brings a considerable and satisfying amount of depth to the character. I read in an interview somewhere that he taps a lot of his inspiration from Shakespeare, and really, the examples he provided made a lot of sense. I wish I could remember where I read it so I could cite it here. If I find it, I’ll provide a link to it later…unless it’s in one of my movie magazines, in which case I’ll just scan it and upload it, haha. Hiddleston’s delivery of his lines was what kept me the most interested in this movie. 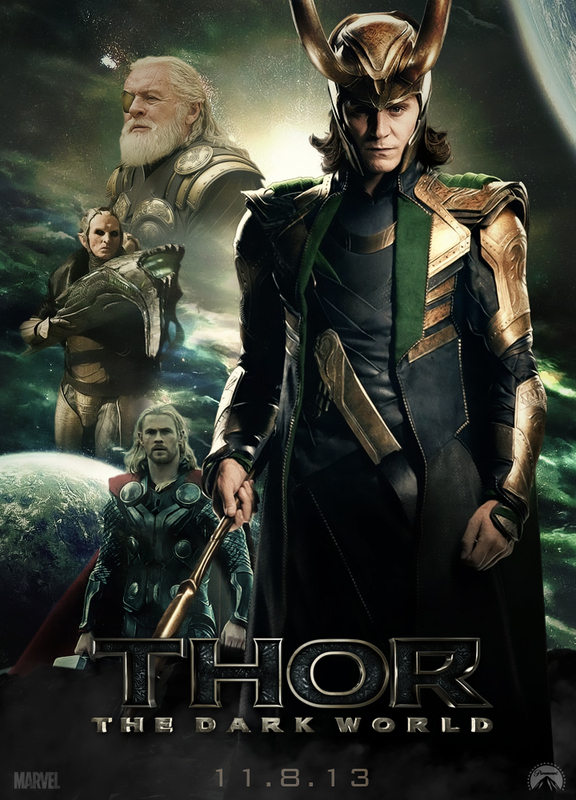 I believe there’s been talk of a Loki-centric movie, and I personally would love to see one. At the same time, I do wonder if it’s possible to have “too much of a good thing,” so to speak. Another aspect of the movie I appreciated was the supporting roles were given a tiny bit more depth this time around. Lady Sif and the Warriors Three had more lines and Zachary Levi, who plays Fandral, was particularly memorable to me this time around. Malakeith is the main antagonist, if Loki isn’t to be counted. I don’t know how big a role he plays in the Thor comics, since I don’t follow that serial closely, but in the movie I felt like the character was just there to move the story along. I was more far more interested in Loki’s character development and story. The ending definitely had me excited for the next movie, as well as one of the extra scenes after the movie ends. I like it when a movie leaves me with questions, and I do hope at least a few of them get answered in the next installment. Nice review Rae. It’s a very fun, exciting and humorous flick that gets Thor right, as well as all of the other characters that surround him.